Dyrholaey “Door Hill Island” or the Arch with the Hole is an incredible promontory on the South Coast in Iceland. 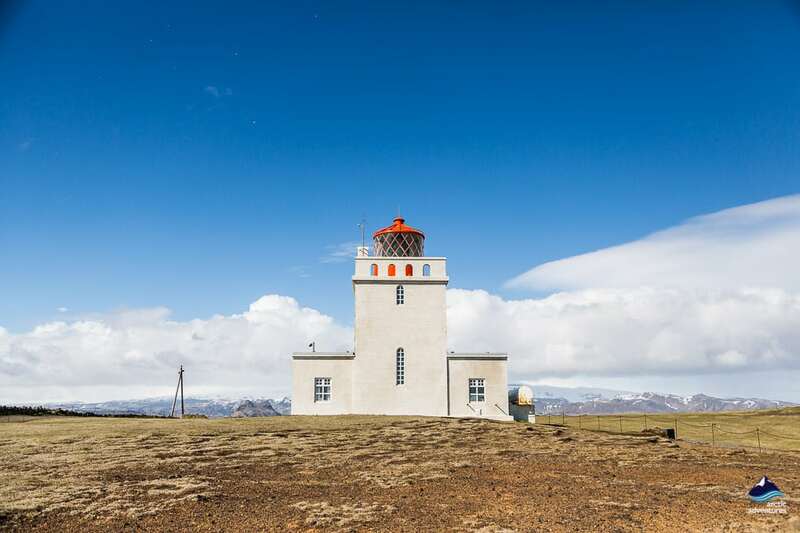 With a stunning and historical lighthouse and stunning views over the black beaches and surrounding glaciers, this is a must do on the Ring Road in Iceland. 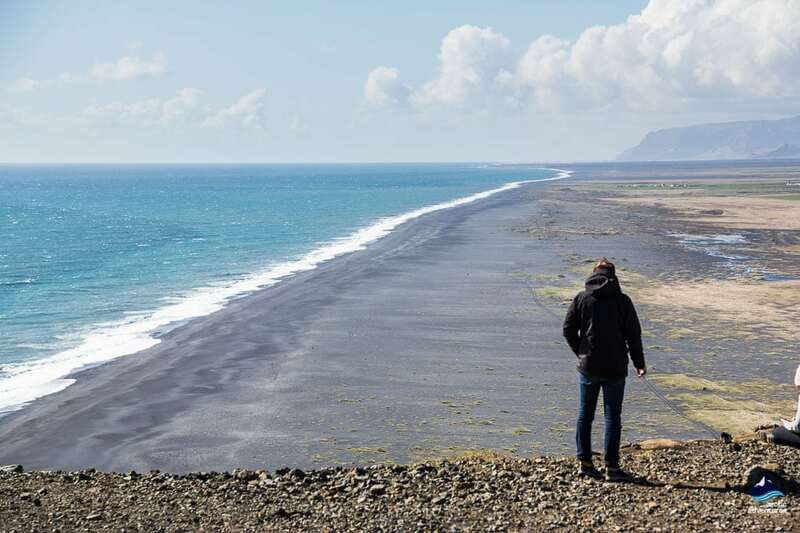 How to get to Dyrhólaey? Dyrhólaey or “Door Hill Island” is a 110-120 meter (360-394 ft) high cape or promontory in Mýrdalur, South of Mýrdalsjökull glacier. 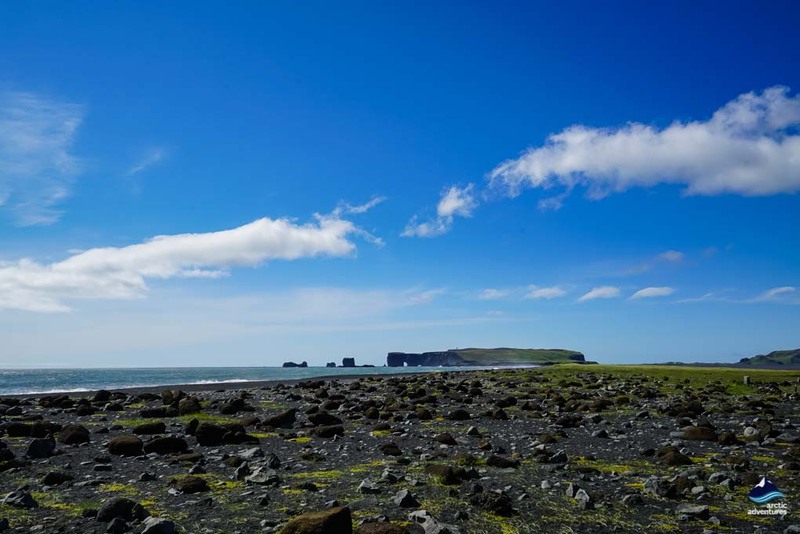 The cape itself is quite large, about 510 hectares (1260 acres) and its promontory is the southernmost part of Iceland. A narrow 100-meter rock spur stretches South out of the cape into the Atlantic ocean with steep perpendicular cliffs on both sides. 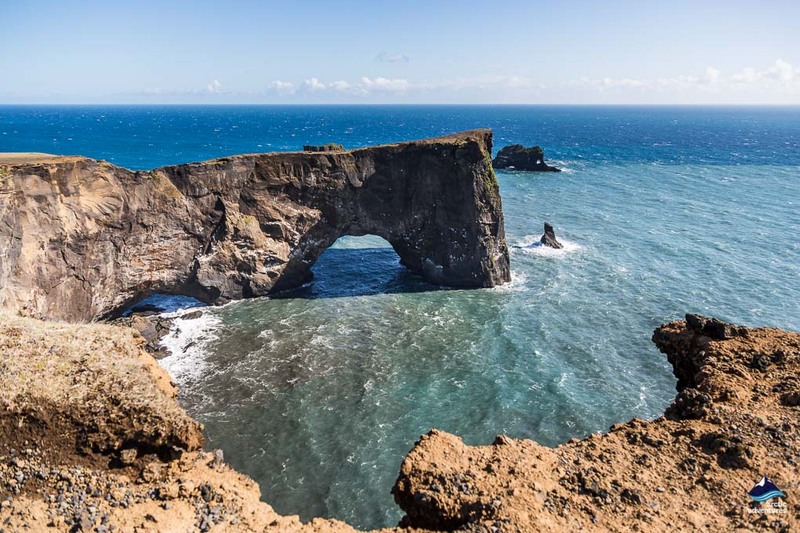 When looked at from the sides you will see the incredible arch-shaped opening in the cape rock, this opening gives the cape its name Dyrhólaey. Boats and even small planes have passed through the arch, hence the name Dyrhólaey. The first airplane went through the cape’s door in the year 1993 carrying two men, they ended up going through three times that day but the two men had tried for years. Dyrhólaey was sometimes nicknamed Portland by sailors and British trawler fishermen even called it the Blow Hole. 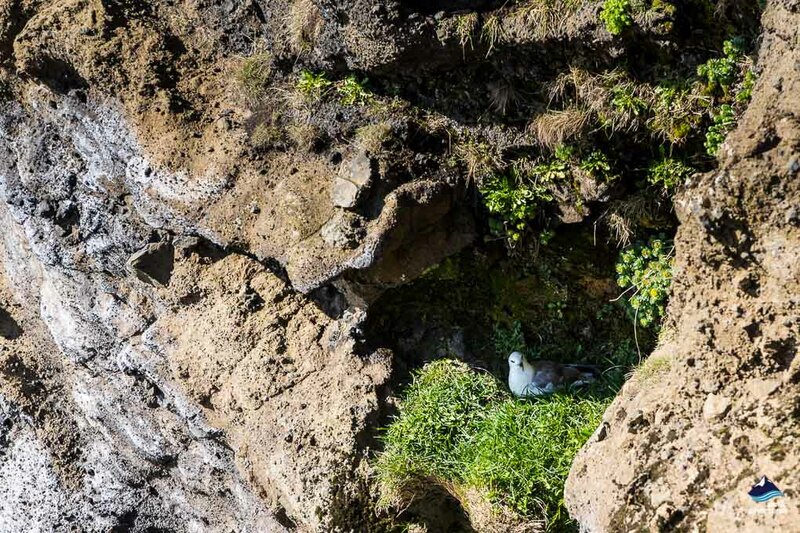 There are a few rocks pillars south off Dyrhólaey and together they create an important nesting ground for colorful birdlife, such as the Eider Duck, the Atlantic Puffin and the Arctic Terns in the lower part of the cape. 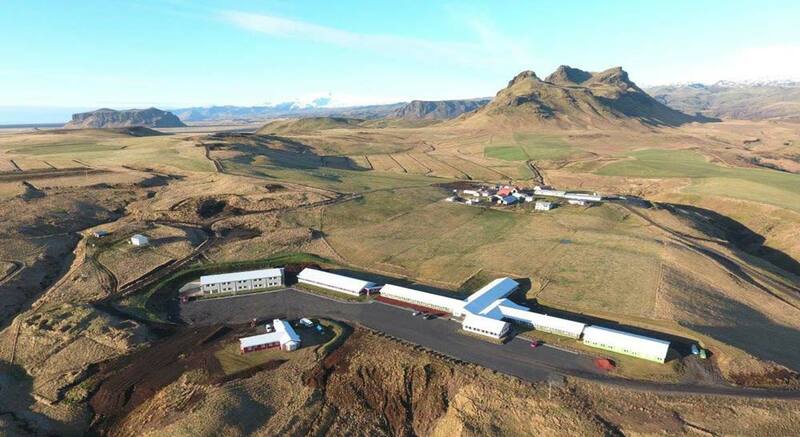 Dyrhólaey is of a volcanic origin and formed late during the last ice age in an underwater eruption similar to the eruption that took place when the island Surtsey formed in the year 1963. It is believed to be about 100 thousand years old. The “island”, or the small peninsula is often split in two, the South and the West as it is made from two different types of rock one being basalt and the other tuff. Even though it is called Dyrhólaey e. “Door Hill Island” it is not an island but a cape or a promontory. 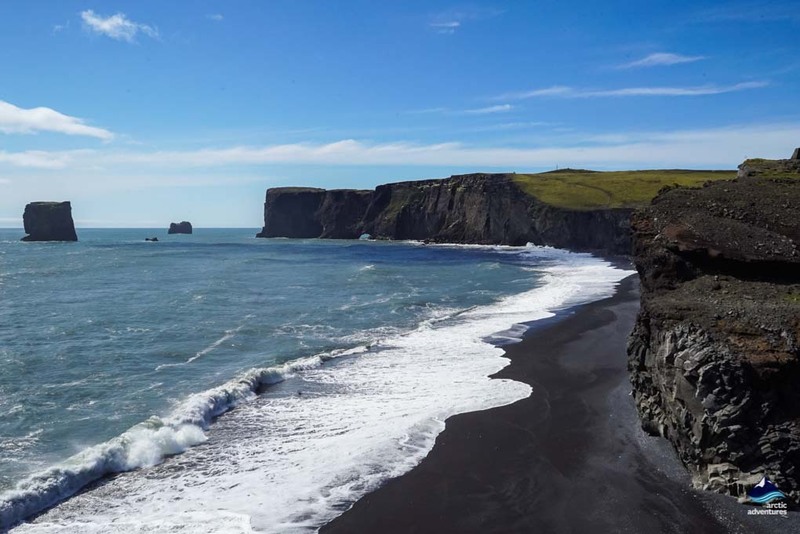 Dyrhólaey is one of the best places to see puffins in Iceland (from May to September). There used to be a nice suit inside the Lighthouse that people could rent to stay on the cape overnight! But unfortunately, it has closed now. 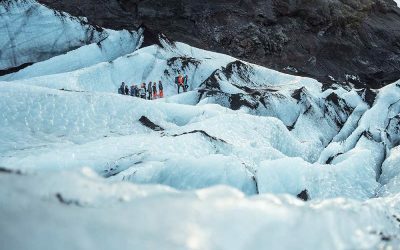 If you stand on Dyrhólaey in clear weather you will be able to see Mýrdalsjökull glacier. 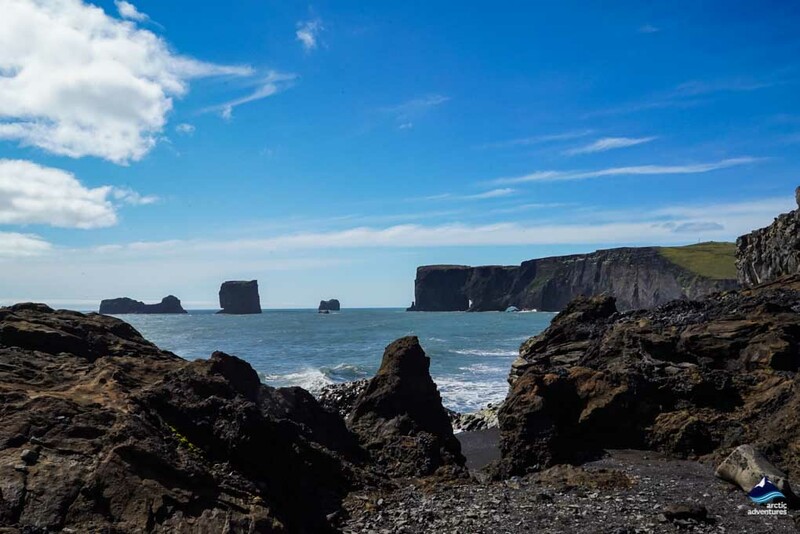 Dyrhólaey is located close to the coastal village of Vík on the South Coast in Iceland and can easily be visited with only a short detour from the famous Ring Road. It is about 181 km (112,4 mi) away from Reykjavík and 18,9 km (11,7 mi) driving from Vík. 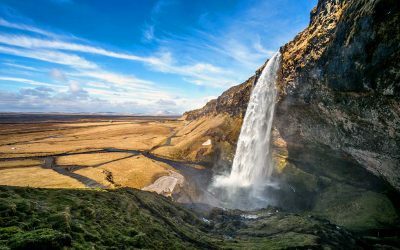 Driving from Reykjavík to Dyrhólaey will take about 2,5 hours in the summertime and will take you past many of the stunning sights in the South Coast, including Seljalandsfoss and Skógafoss waterfalls. 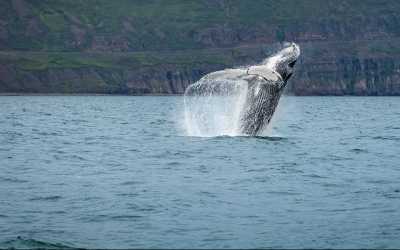 The drive will give you a view of the Westman Islands in good weather and once you are on the cape even greater views! 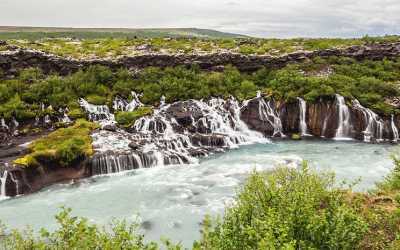 From Reykjavík, you follow the Ring Road 1, through the town of Hveragerði, Selfoss, Hella and Hvolsvöllur, past the waterfalls and Eyjafjallajökull before seeing a marked right turn to road 218 which you follow until you reach the parking lot. 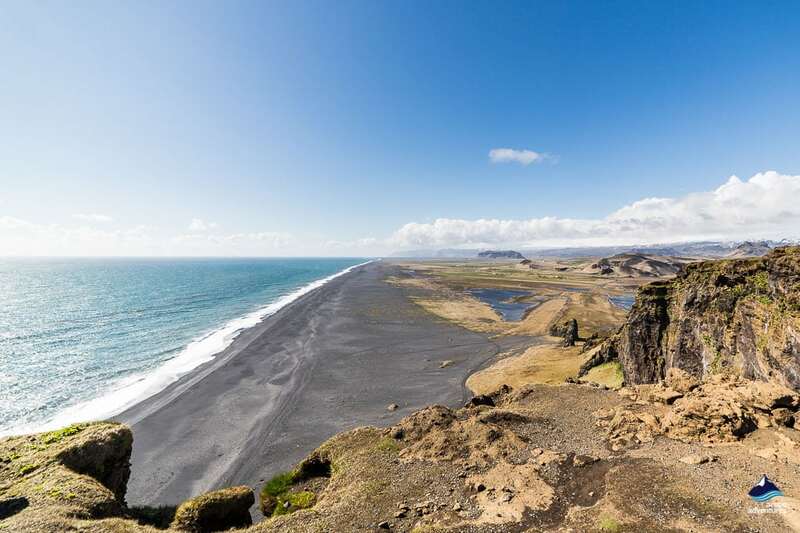 Driving from the East to Dyrhólaey should, in the summertime, take about 1 hour 20 minutes from Kirkjubæjarklaustur, 2 hours from Skaftafell National Park and 2 hours 50 minutes from Jökulsárlón Glacier Lagoon. 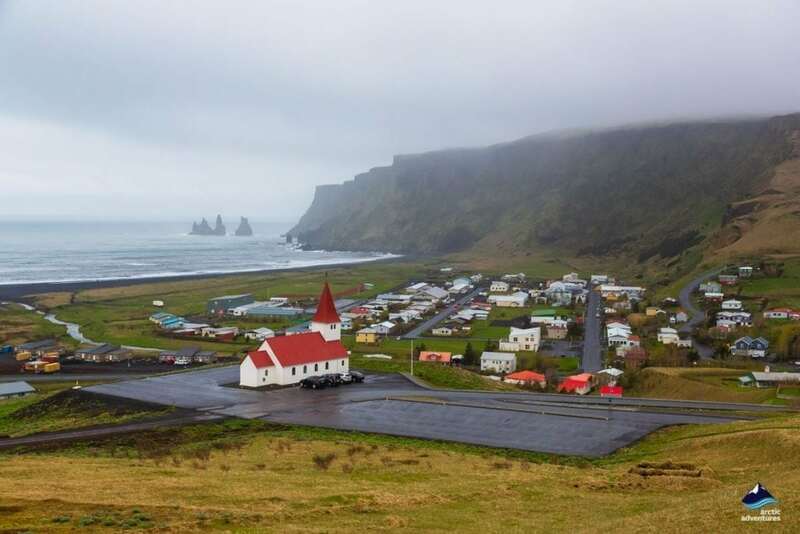 There are a few different ways to visit Dyrhólaey, you can do a self-drive adventure, you can join a guided tour (see at the bottom of the page) or take a bus to Vík and walk the path to Dyrhólaey. 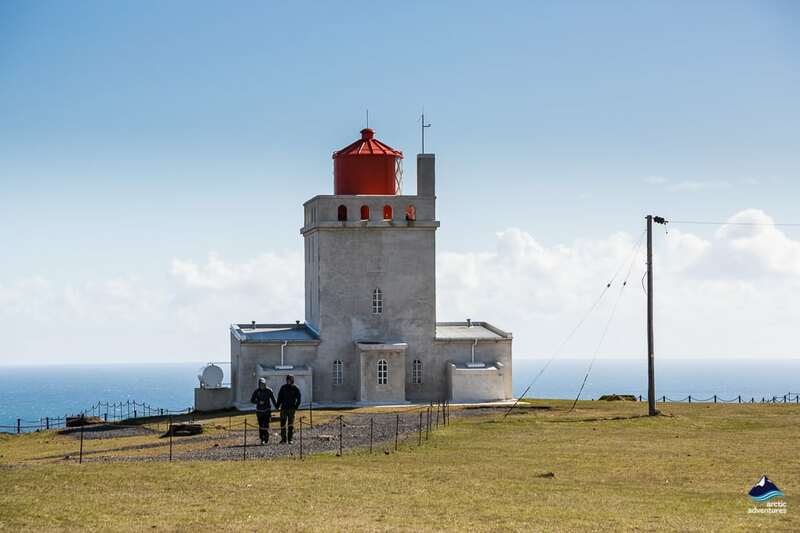 The Lighthouse on Dyrhólaey is the lighthouse house in Iceland with the most light power and was the first radio house built in Iceland used in the second world war. 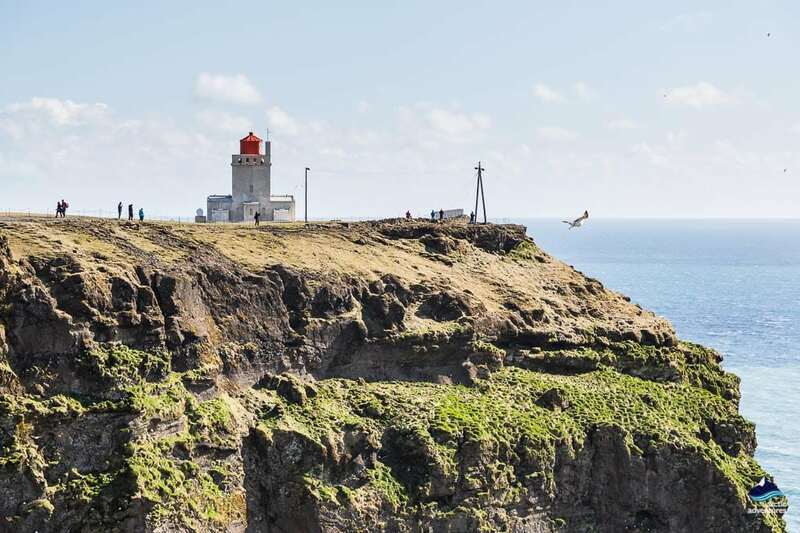 The first construction to build a lighthouse on Dyrhólaey started in the year 1910. The first lighthouse was a skeletal steel town originally made in Sweden and it wasn’t until the year 1927 that the lighthouse we see today was built, making it almost 100 years old! 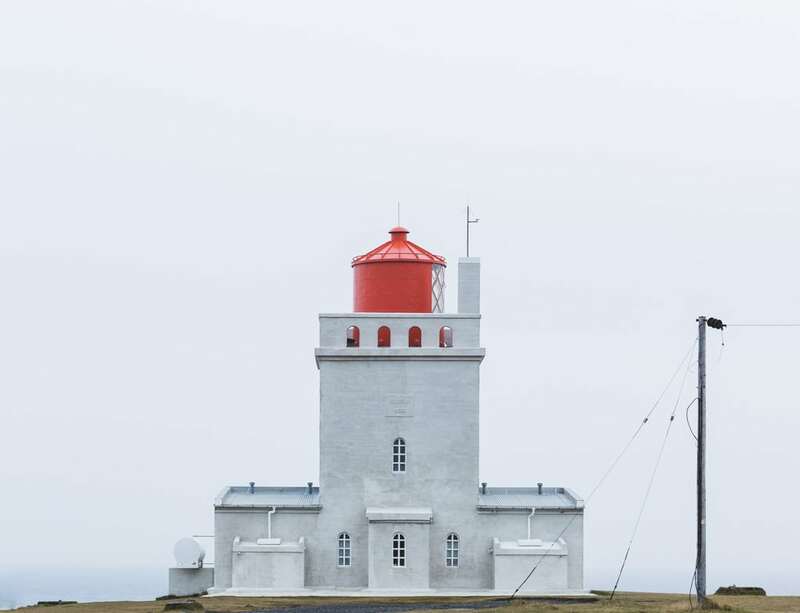 The Dyrhólaey Lighthouse, in Icelandic Dyhólaeyjarviti, is located at the cape’s top visible from sea and land and it’s flickering light flashes every 10 seconds so it is hard to miss. The architecture is quite simple, consisting of square concrete blocks one on each side and then a longer block that towers in between with a red lantern house on top. The fence around the top has a castle feel to it with cut out “non-glass windows”. The lighthouse’s first architect was Guðjón Samúelsson also known for his work on Hallgrímskirkja Church downtown Reykjavík, Hotel Borg and Sundhöll Reykjavík e. Reykjavík’s swimming pool. 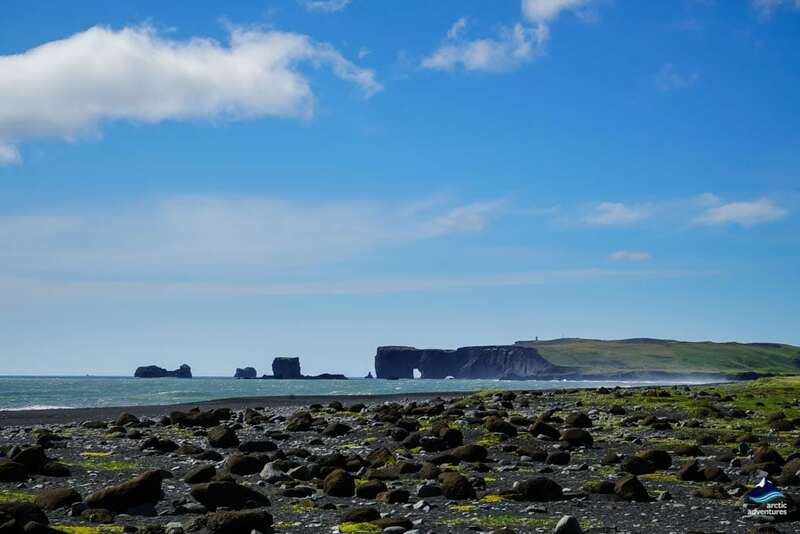 In the ocean surrounding Dyrhólaey cape, you will find the other rock pillars and together they form one of the most important nesting grounds in Iceland. 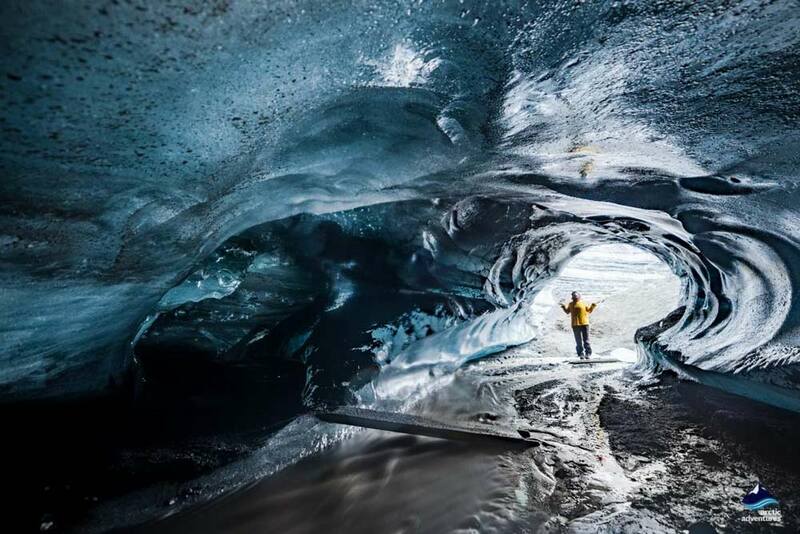 Highest of these rock formations is Háidrangur stretching 56 meters (34,7 mi) into the sky. The nesting ground is home to many different bird species but the most common are Either Duck, Puffins, Seagulls and Arctic Terns. 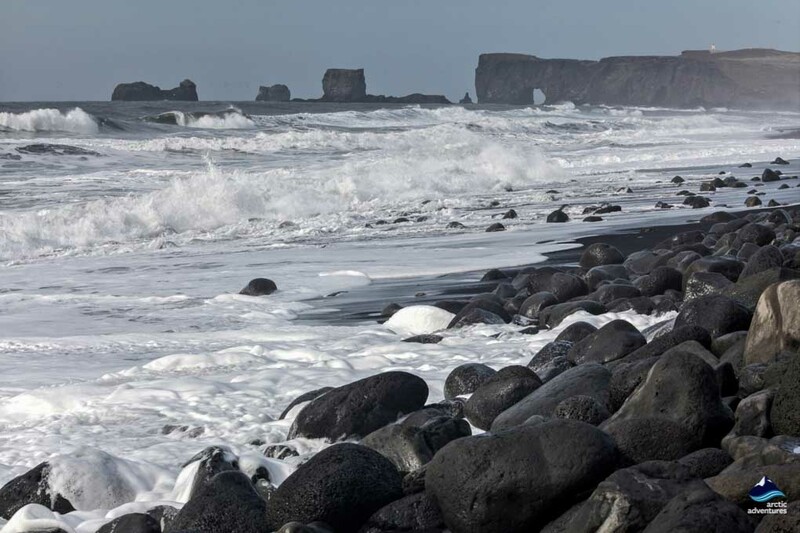 During the nesting season, in spring and summer, access to Dyrhólaey is often limited. This is done to protect the birds and so they don’t get scared off. 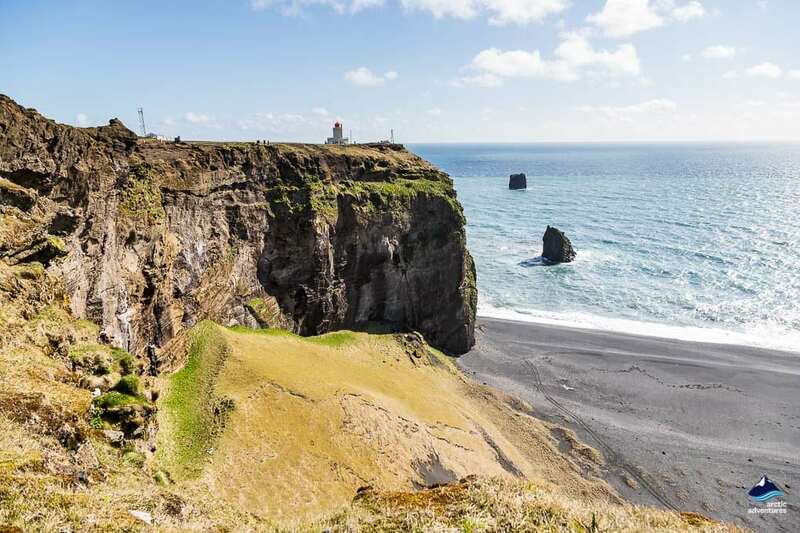 Still, Dyrhólaey remains an excellent place to view both puffins and pufflings and has attracted wildlife photographers from all over the world. If you are visiting in Summer or Spring make sure to go when it is open, the access is limited due to bird nesting. From the 8th of May till the 25th of June you are allowed to explore the area from 9 am to 7 pm. It can get very windy and frankly, quite cold, dress accordingly! Be very careful not to go too close to to the edge of the cape. The Puffin is anything but a shy bird and they often allow people to get very close. However, if you do get to close or try to touch them they might be startled and then the whole flock will follow. Be respectful of them and their home, you are a visitor. 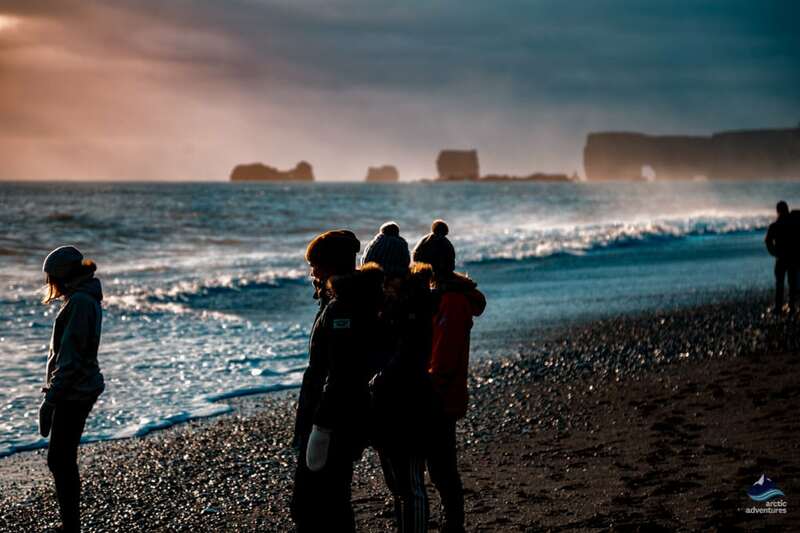 Before visiting Dyrhólaey in Winter you will need to be aware of a few things. Driving there might be more challenging if you aren’t used to driving in icy or snowy conditions. Still, Southern Iceland is warmer than the North. You will need to dress warm, as the wind makes any temperature feel even colder! 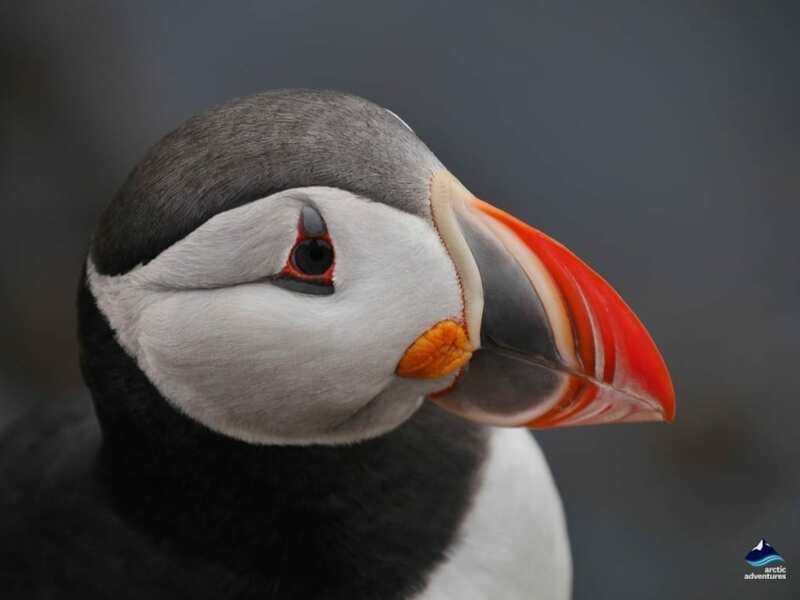 Don’t expect to see Puffins or Arctic Terns, they are only there in Spring and Summer. Access to the area is not limited in winter, so take your time to explore this true natural gem! 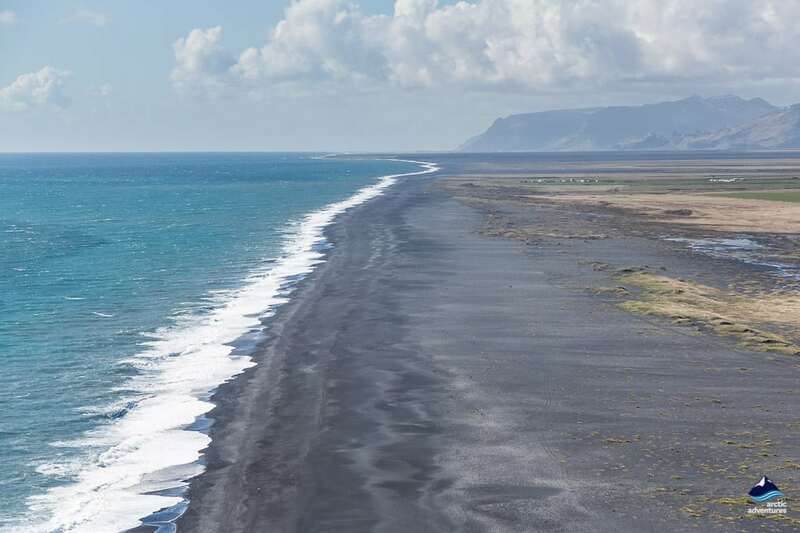 If you are worried about the paths being slippery Dyrhólaey can easily be viewed from the Black Beaches surrounding the cape. Noah (2014) Most of the filming for Noah took place in Iceland and a great number of sights around the Southern parts of Iceland were used including the black lava cliffs at Dyrhólaey. Hjartasteinn e. Heartstone (2016) The Icelandic film Hjartasteinn has won awards all around the world and gets our full recommendation. This dramatic film has a scene on the cliffs of Dyrhólaey where the boys are being taught to abseil down to collect eggs. Sense8 (2015) In episode 1 season 1 a young Riley is seen walking into a cavern by the sea with views of Dyrholaey in the background. Riley visits the cavern once again in the present day in episode 9 season 1. 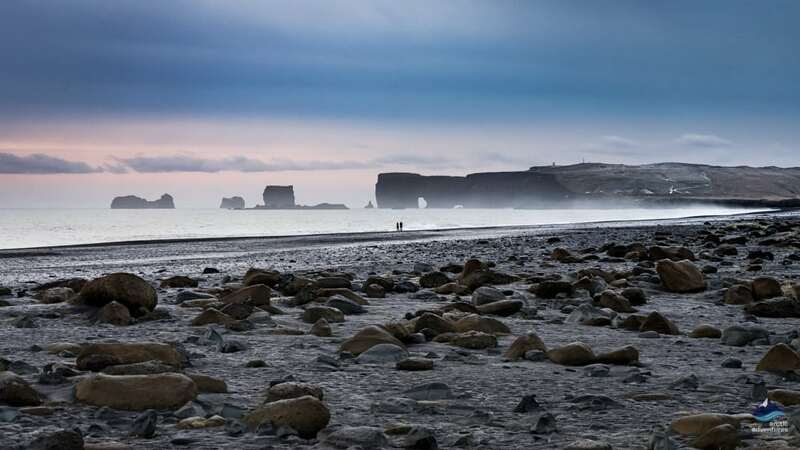 Lost in Space (2018) The cast has been seen filming at Dyrhólaey but at the written time season 2 has not been released. Justin Bieber – I’ll Show You (2015) Bieber got the “Iceland-Fever” and filmed two different music videos here. 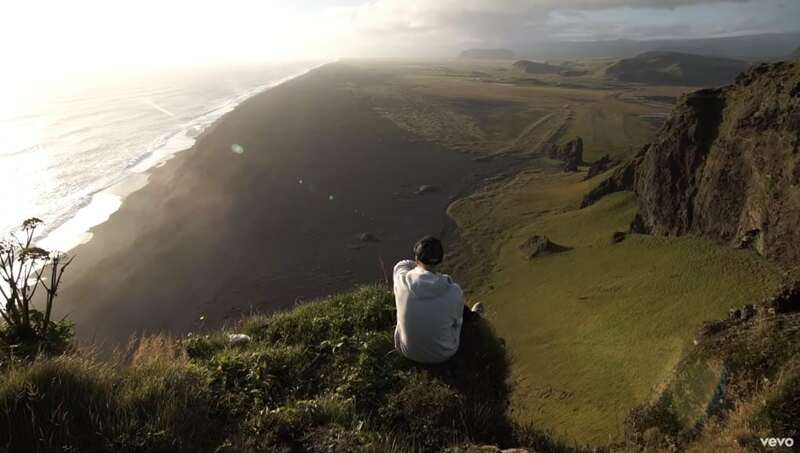 In the video for I’ll Show you Bieber is seen sitting on a ledge on Dyrhólaey. Although it looks great in the video, a fence has now been put up to stop people from doing the same, don’t try remaking the scene it is simply not safe. Marco Mengoni – Ti Ho Voluto Bene Veramente (2015) The Italian X-Factor Singer is seen in a dramatic scene with Dyrhólaey in the background.